Australian cities score high in liveability awards. Melbourne has topped The Economist’s most liveable cities ranking five years in a row, with Adelaide, Sydney and Perth not far behind and Brisbane in the top 20. Australian cities rank well in other liveability surveys, too, if not so highly. Environment is one of the key factors that these surveys measure, but the data and methods being used are not very sophisticated. Green infrastructure is a key contributor to these rankings. The networks of green and blue – taking in rivers and streams, parks, green wedges, gardens and tree-lined roads and rail – underpin urban liveability. Yet, if we look at these valuable assets, they are mainly historical legacies of the 19th century. They include The Domain, Treasury-Fitzroy Gardens and Royal Park in Melbourne, Hyde and Centennial Parks in Sydney, King’s Park in Perth, the Adelaide Parklands and those in Brisbane, Hobart and Canberra. Their creation was driven mainly by visions of what a city should look like and provide for its people. This was long before the invention of cost-benefit analysis and many of the other tools used to make the economic case for infrastructure. Today, if a key parcel of land is up for development, green infrastructure is often an afterthought, if considered at all. The recent reports that the former Victorian government rezoned Fishermans Bend, a former industrial site of 455 hectares, without proper regard for grey or green infrastructure are not unique. In an area threatened by sea-level rise, increased flooding and heat island effects, to allow development that exacerbates these issues is extremely short-sighted. But this is happening in many localities. Changing climate and the unintended consequences of small decisions, such as urban infilling, are making cities hotter, more prone to flash-flooding and less green. 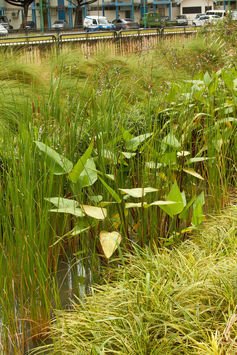 Rain gardens have aesthetic and practical value as they reduce urban flooding by slowing water run-off. Local government authorities are on the front line with these issues. They carry the major burden of responsibility for developing and maintaining neighbourhood environments. Over the last few years, some councils have considerably increased spending on park renewal, rain gardens to slow runoff, water capture and recycling and urban forest strategies. However, this is occurring in an economic environment where local government’s resources are limited and efficiency is emphasised at every turn. State governments run on a platform of capping rates, not considering whether those rates reinvested by council generate ongoing socially beneficial returns. When communities are asked what they want councils to invest in, green infrastructure is usually high on the list. Local government has recognised these pressures, identifying the need to build better business cases for green infrastructure projects and programs in order to justify their expenditure. A recent collaborative project, involving four metropolitan Melbourne councils and Victoria University, has put together a framework to help local government identify the benefits of green infrastructure over its whole lifecycle. The aim is to build better business cases to support projects and develop asset management programs for green infrastructure. This would lead to trees and parks being considered in a similar way to roads and buildings as assets that provide a stream of benefits to the community over their lifetimes. Valuing the benefits of green infrastructure is tricky, though. This is because each element provides multiple benefits, which cover very different types of value. For example, a wetland can provide flood protection, substitute for external water supply, cool an area, increase biodiversity, provide recreational opportunities and contribute to adjacent property value. These wetland benefits are public, private and intrinsic. High-quality open space can contribute to people’s physical and mental health and wellbeing. This has the results of offsetting medical costs and promoting higher economic productivity and improved human welfare (happiness and satisfaction). Putting a dollar figure on all of these benefits is extremely complex. The long-lived aspect of green infrastructure also means it can play a major role in adapting to changing climates within urban environments. The future value of flood protection, cooling services, amenity, recreation and human health and welfare can be substantial. However, current methods of discounting future dollar benefits, at roughly 5% each year, undervalue these long-term benefits. A recently completed project in Melbourne’s west identified the potential for welfare and environmental benefits exceeding A$300 million over 30 years (discounting at 3.5%) by reducing pollution from an industrial precinct using integrated urban water management principles. The framework is a starting point for councils to address the economic value of green infrastructure. It is different to most other frameworks, with the emphasis not being on how to select the type of infrastructure, but on how to get a project or program valued, approved and implemented. It has been tailored to existing council processes so it can be used now, but also grow as council programs evolve. One major gap that our work has pointed out is the lack of available data in Australia to measure green infrastructure benefits with confidence. They are there, but it would be great to rate liveability with confidence and to have it on the same footing as income or GDP.